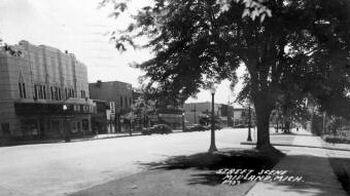 The Mecca Theatre was one of the first movie houses in Midland, Mi. My grandfather, Bart Laughlin, owned it from 1922-25 and did live theater presentations and other attractions in addition to showing films. He sold the theater to Frolic owner Mr. Cassidy and was required to sign a lifetime non-compete agreement. The Frolic was the more modern theater of the two that were located on Main St. However, my grandfather held the Paramount contract and in the 1920s, Paramount was The choice film company. From that point on, Mr. William Cassidy owned all the movie houses in this town. My Gr. Grandfather was the owner of the Frolic Theater, his name was David M. Bye. He also owner several other businesses in the surrounding area. According to my father, he was the richest man in Midland other than Willard Dow. I do know that he was quite wealthy as he was heir to monies from his father Lord Bye, from England. What a thrilling surprise. a picture of the Frolic! During 1953 I was nine years old. I have wonderful memories of spending Saturday afternoons at the Frolic Theater. 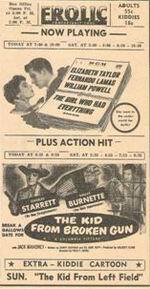 Twenty-five cents would get us in and we could stay all day watching Flash Gordon, Gene Autry, Tarzan, and so many others. Life was good. I don''t know when this theater was built, but the Frolic was one of two theaters on Main Street in Midland around 1940, 1941. The other theater on Main Street was called the Mecca Theater. If I remember correctly. there were at least two fires. The first one I remember was around 1943. 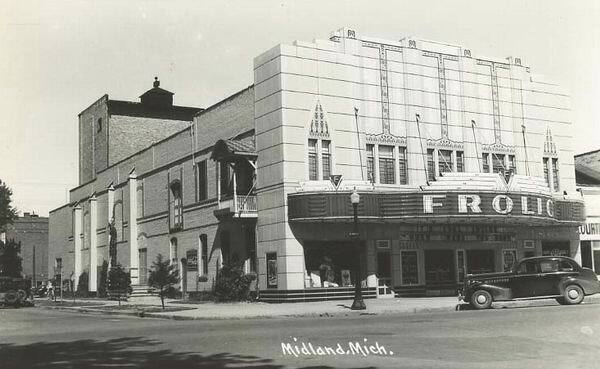 When the Midland Theater was built out at the Circle around 1940, 1941, the Mecca closed while the Frolic remained open. WOW - This old downtowner was quite something else based on this old photo. The place appears to date from the late 30s or early 40s based on the vehicle parked out front. May 1959 Issue - Mrs. Delores Cassidy has closed the Frolic at Midland.